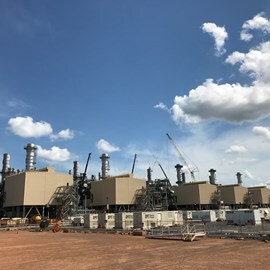 Inpex has initiated the start-up of gas turbine generators at 490MW onshore combined cycle power plant (CCPP) near Darwin, Northern Territory, Australia, which will provide power capacity for the $34bn Ichthys LNG Project. The move marks a step ahead for Inpex-operated Ichthys LNG Project to become the world’s first LNG plant to use combined cycle technology, Inpex said. Ichthys project managing director Louis Bon said: “Initiating the safe start-up of the gas turbine generators (GTG) illustrates the strong commitment of the onshore team to overcome challenges and achieve our targets. Power generated from the CCPP will be supplied to Ichthys Project Onshore LNG Facilities at Blaydin Point to allow LNG processing trains to cool and liquefy natural gas. The CCPP, which will use natural gas as fuel from the Ichthys Field, features five gas and three steam turbine generators to generate electricity. The gas turbines are designed to produce waste heat, which will be used to create steam for the nearby steam turbine system. Bon added: “With more than 50% energy efficiency, the CCPP will provide energy efficiency well above the 30%-35% typically achieved by a standard industrial gas turbine open cycle power plant and will allow the Project to use saved fuel gas to produce more LNG. The Ichthys LNG Project will have peak production capacity of up to 8.9 million tons per annum (Mta) of LNG, up to 1.65 MTA of liquefied petroleum gas and 100,000 barrels of condensate a day. Image: Ichthys LNG Project is operated by Inpex. Photo: courtesy of INPEX.